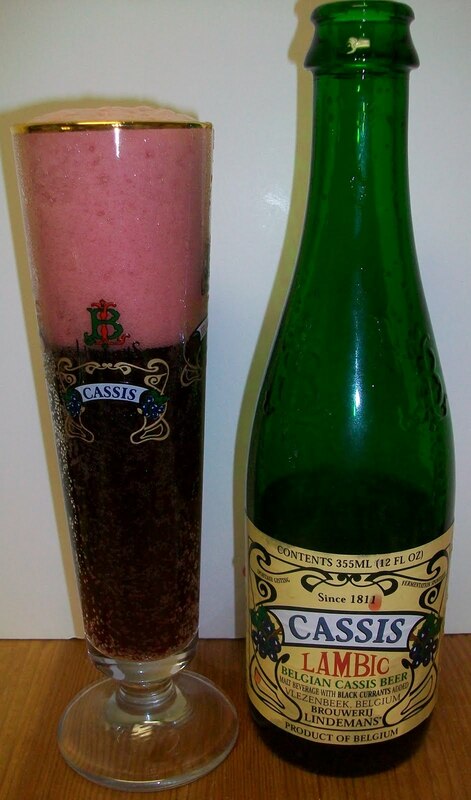 Commercial Description:Lindemans Cassis is a lambic made from local barley, unmalted wheat, and wild yeast. After spontaneous fermentation the lambic is aged in oak. Black currants are added creating a secondary fermentation and yielding an ale of exceptional flavor and complexity. Background:This was totally impromptu. Actually this will probably not be a review. I had a bottle in the fridge and when we were having a berry fruit bowl dessert it seemed natural to pour this bier over it. Well, seemed natural to me. At any rate I took some pictures so let’s see how this goes. Review:The Bier pours a dark ruby almost purple in color with an almost pink rich head. This is a very sweet and fruity nose, with sweet black currents and yeasty background. Well, this is really too sweet for me. It’s like a carbonated blueberry juice if you could image what that may taste like. I don’t think I have actually had a Currant but based on what this taste like I suspect that Currants are very similar to blueberries. There is also a very tart and sour background to this that comes from the base Lambic. Fruit is added to the base lambic and then another fermentation and aging after that. So this style of bier does have some complexity but the bottom line is that it is really just too sweet for me. It’s ok to sip but I don’t think I could consume a bottle or for that matter even a full glass. But on the other hand, it makes a great topper! 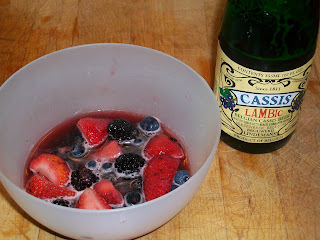 This was excellent when poured into a bowl of fresh berries. I would suspect it would hold up to ice cream also. In this respect it is very similar to Framboise. Well, I’m not really sure what this was; somewhat of a review but mostly just an FYI on another fruit lambic. This almost more of a warning then a recommendation but don’t buy a fruit lambic and expect something that taste like beer. They are very sweet and tart carbonated syrup. Not quite that thick but much heavier then any type of juice. So if you are looking or something different try a fruit lambic. And Yes, it is really great over fresh berries or ice-cream.